The New Classic Trout Bag range from Snowbee offers a modern twist on a traditional theme. Made from a tough 600D nylon with a PVC laminated backing, making the material 100% waterproof. The attractive two-tone Light Olive Green and Black gives this new range a smart, functional appearance, which is backed up the practical designs. A traditional style Trout/Game bag, with a large interior compartment with two rear bellows pockets and a zipped top closure. On the front is a full width, elasticated mesh game pocket. Cover flap with two quick release clips. 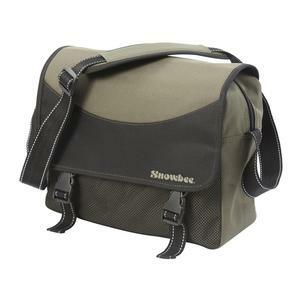 Appears a well made and good looking bag.